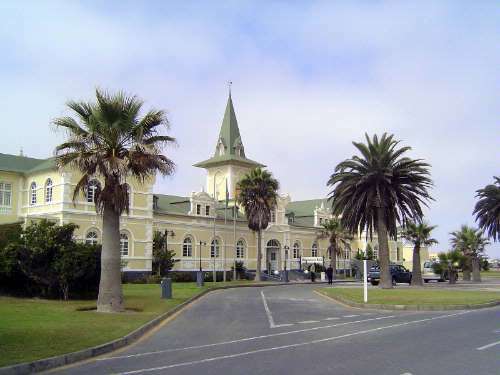 A few minutes later we arrive in Swakopmund. Here's the former railway station, now the lobby of a hotel attached to the rear. Built in 1901, the station was dressed up for a reason. After all, the overseas German Empire at the time had only two railways. One was in German East Africa, now mostly Tanzania. This was the other, the Kaiserliche Eisenbahnverwaltung and Swakopmunder-Handels-Gesellschaft. The building looks much better if you can squint away the later addition of the top hat.